Notes: 1. 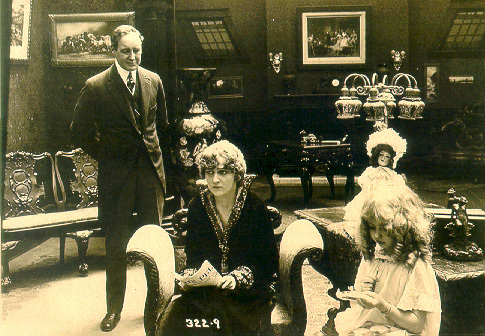 An erroneous release date, August 28, 1916, is given for this film in a review in The Moving Picture World August 26, 1916. The same publication had a great deal of difficulty with the last name of the scenario writer, Johnston, and frequently made it "Johnson" in reviews and notices for various films of this period. For this particular film, the same publication listed "A. Wayne" as a member of the cast; Wayne Arey was intended. 2. Warren Cook's name appeared as John Cook in at least one account. "You remember the extraordinary success of 'Little Mary Sunshine.' Here's another like it, full of the appealing touches that only genius can give." The advertisement reproduces a testimonial from Thomas D. Sorerio, manager of the Park Theatre, Boston, dated August 9 (before the actual release): "'The production of The Shine Girl I received last night. I immediately screened it before an audience of 100 prominent Bostonians this morning at the theatre. Had special music to go with it, and it met with a unanimous approval. Personally it is one of the best productions I have seen in a long while. The acting throughout was very well done, detail work perfect, photography wonderful. The star Miss Gladys Hulette played the part of the Shine Girl to perfection. One thing that I must mention about her is that she is very attractive and knows how to dress well, which makes her very pleasing to the eye. The picture is one of the cleanest productions I ever saw put together, as there is nothing there to offend anybody. It makes a pleasant entertainment for all those who wish to go to a good, clean show, and if you will continue making such pictures, you will always find a big market for them, for they are just what the people want, just what the exhibitors also want.'" "The Park Theatre in Boston, managed by Thomas D. Sorerio, had one of the biggest days in its history on Monday, September 25. Gladys Hulette, the Thanhouser star, appeared in person at three showings of her Pathé Gold Rooster play, The Shine Girl all week. Such a drawing card was Miss Hulette that the Park played to capacity all day and crowds were waiting to get in even for the 6 o'clock performance. When Miss Hulette arrived at the theatre for her afternoon appearance, after she was snapped by the newspaper photographers and the Pathé Weekly [newsreel] man, she was taken to her dressing room over the entrance to the theatre. Ten minutes later, when she tried to leave the room, the key jammed in the lock and she was unable to get out. (At least so said the Thanhouser press agent.) She had to appear on the stage at 3 o'clock. An extension ladder was run up to the window from which Miss Hulette was calling for aid. By this time the street was crowded with people from curb to curb. Miss Hulette obviously couldn't climb down three stories, above the heads of such a crowd in the gown she was going to wear on the stage. Somebody solved the problem by finding a pair of overalls. Miss Hulette donned the overalls, scrambled down the ladder and ran into the theatre, on time for her performance. In the evening Mr. Sorerio gave a banquet for Miss Hulette." "The Shine Girl, the Pathé Gold Rooster Play produced by Thanhouser, has been taken up by women's clubs everywhere. 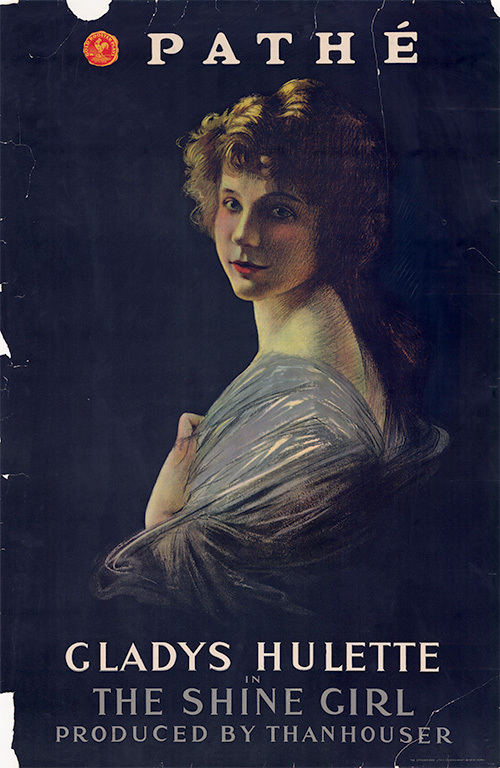 In San Antonio, Texas, according to The Light, of that city, the local Women's Club arranged for a private showing of the picture, and after seeing it the members told the reporter that The Shine Girl was 'the cleanest, sweetest picture' they had ever seen, declared that there should be more pictures of the sort to 'bring sunshine into people's lives.'" "The only sunshine that penetrates a basement is five feet of cheerfulness - the Shine Girl. While shining shoes with her little hands she polishes the grouchy and brooding souls with her cheerful word and happy smiles. Then comes the day when a cloud temporarily eclipses her sunniness. Her heart torn by the poverty of a sick neighbor, she steals a loaf of bread and is taken to the Children's Court. A rising young judge sits upon her heavy offense, but his square jaw is softened by a pair of kindly eyes, and he not only pardons but develops deep interest in her. He takes her to his mother's home in the country where she can have some real sunshine, and eventually the little orphan is adopted. While home the judge meets again the sweetheart he has never forgotten, now unhappily married. The old love is revived, and forgetting the justice he practices, he plans to flee west with her. The Shine Girl discovering the intentions of her hero who is about to totter from his pedestal at the risk of losing her sunny paradise of a home, bravely sets out to stop them. She heads off a message to the woman, and going to the station herself, reminds him gently of the words that went with her pardon, 'It isn't square to steal what belongs to someone else,' and asks him 'Is it square to steal another man's wife?' Saved by her at the brink of a great unhappiness, he returns to the city and tries to forget. With next apple blossom time he returns to find his Shine Girl budding into womanhood and with the womanhood and with the passing days love awakens within the hearts of both and before he returns again the Shine Girl promises to be his for 'keeps.'" REVIEW by Agnes Smith, The Morning Telegraph, August 6, 1916: This review is reprinted in the narrative section of the present work. REVIEW by Margaret I. MacDonald, The Moving Picture World, August 19, 1916: This review is reprinted in the narrative section of the present work. "Gladys Hulette has been featured in this five-part production from the Thanhouser studios. A full review of the picture will be found elsewhere. Briefly speaking, the character of the 'Shine Girl,' a bootblack by a vocation, is an exceptionally beautiful one. The central theme of the story has been clearly defined in the production, and being human in character, will be enjoyed by all." "Here we get a human idea dressed up with a few melodramatic touches which give a swing to the action and serve as a nice contrast to the slower human moments. The entire story centers about the characterization of Gladys Hulette, and this little lady certainly makes good in this, registering a personality which is truly delightful. In many of her close ups she appears very beautiful. Wayne Arey, as the young judge, was decidedly impressive and convincingly human throughout. Other of the principals, particularly the erring wife, were quite mechanical in their actions, the thought coming to me that they were suffering from too much direction. Little Ethelmary Oakland, as the tot who was trying to help her mother and father be agreeable, was given some very cute scenes, there being a number of decidedly pleasing bits between this youngster and Miss Hulette. "The central story idea of this was splendid, it having to do with a little girl of the slums who made a living by shining shoes and attempted to carry joy to the miserable by smiling herself and suggesting that others try to be happy. She was arrested for stealing a loaf of bread to give to hungry friends, but the young judge of the juvenile court released her after explaining that it was not square to take what belonged to another. As an experiment, the judge sent the child to his country home, and there she grew up with his aged mother. Some years later, we found the judge planning to elope with the wife of his friend, whom he had loved for years, and the 'Shine Girl' learned of the plans and spoiled their elopement by confronting the judge with the words of their first meeting, 'It is not square to take something which belongs to another.' The little messenger of happiness managed to bring the erring wife back to her husband, and eventually she became the happy bride of the judge. "Some of the exteriors in this were decidedly artistic, because of good composition and effective lighting, and the atmosphere of the slums was very good. There was some good melodramatic stuff at the finish, where the child fell into the water and Miss Hulette rode down a steep bank and swam her horse out into the lake to rescue the youngster. The titles for the most part were very good. One of them at the finish will suggest their general character. It was something like this: 'Sorrow is like shoe polish. When first put on, it makes the shoes look bad, but in the end it is what gives them the brightest shine.' One telegram which figured prominently in the action was printed instead of being typewritten, which is inexcusable. "The Box Office Angle: Taken as a whole, I would say that this is a production which will be decidedly satisfying with any audience, highbrow or lowbrow. It is sufficiently artistic to please the discriminating, and surely it has a good audience appeal because of the central thought. This is not a wonderful production technically, because of a few little things which hold it down in the 'good' class instead of allowing it to soar to great height, but it surely is a splendid audience film. When it comes to box-office appeal, I doubt whether Miss Hulette can pull you much business, unless you go out and aggressively boost this as an artistic, human presentation of a truly big idea. You can possibly arouse a lot of interest in this by announcing that it deals with the juvenile court problem, for this is a question of general interest. If you wanted to start a discussion, you might say in your ads, 'Is it any worse to steal a man's wife than it is to steal a loaf of bread?'"